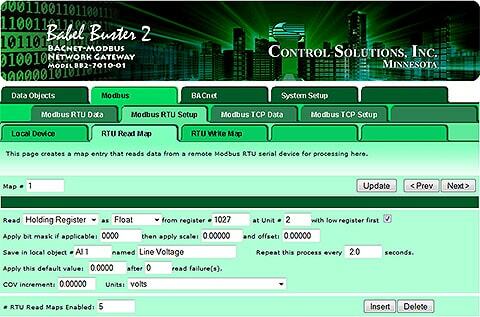 The Babel Buster BB2-7010 Modbus to BACnet IP gateway allows Modbus devices to communicate with BACnet IP devices. BACnet objects may be read as Modbus registers, and Modbus registers may be read as BACnet objects. 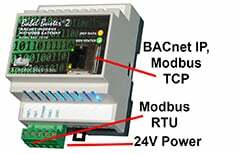 The Modbus to BACnet IP gateway acts as a translator between the two protocols. The Modbus to BACnet IP gateway may be both Modbus TCP client and server at the same time, and can be configured to also be a Modbus RTU master or slave that runs independently of Modbus TCP. The BB2-7010 will continuously poll Modbus registers in TCP or RTU devices and make that data accessible as BACnet objects. Configured to go the other way, the BB2-7010 will continuously poll objects in other BACnet devices and make that data accessible as Modbus registers for other Modbus masters polling the BB2-7010. An available variation of the BB2-7010 also includes an SNMP client and server that translates and shares data between BACnet IP and SNMP devices. The SNMP agent (server) also has the ability to send traps on threshold rules set by the user. 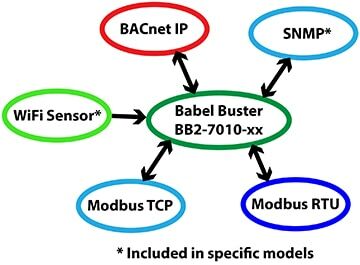 Babel Buster BB2-7010 BACnet IP to Modbus Gateway provides a BACnet IP client and server, Modbus TCP client and server, and Modbus RTU port configurable to be master or slave. 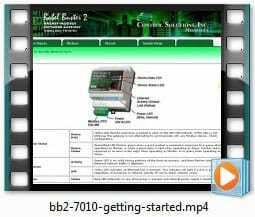 Most often used to connect Modbus devices to a BACnet IP network, the BB2-7010 is configured via simple web page templates to read and write Modbus registers in one or more Modbus slaves, making that data accessible as BACnet objects on the BACnet IP network. 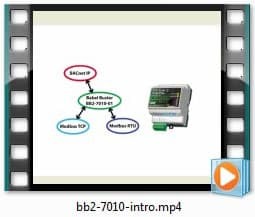 The BB2-7010 includes a BACnet IP client which allows BACnet IP devices to be accessible from Modbus TCP or RTU. You configure the device instance, object type and instance, and poll interval for reading or writing BACnet objects. 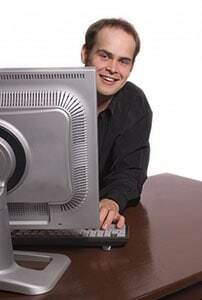 The object data is stored in the BB2-7010 server for subsequent retrieval by any supported remote client (or master). The same polling schemes that apply to Modbus also apply to remote BACnet IP slaves polled by the BB2-7010's BACnet IP client. A large number of BACnet objects gives you flexibility in mapping Modbus registers to any combination of BACnet objects. Packed Modbus registers may be parsed to multiple BACnet objects when reading. Multiple BACnet objects may be packed into a single Modbus register when writing. All standard Modbus register types are supported. Value objects will poll their assigned Modbus register at the interval you specify. The content of the Modbus register will be given as the Present Value of the BACnet object when read. The Modbus register is written each time the BACnet Value object is written. The Value object corresponds well with the Modbus Holding register. Input objects will poll their assigned Modbus register at the interval you specify, and provide the Modbus data as the Present Value when read. Commandable Output objects are used to write Modbus registers, and will update the Modbus device each time BACnet is updated. Troublesome ground loops can be created when the Modbus network and other ground points are connected together. This loop is broken by using the isolation option. The BB2-7010-ISO provides 500V isolation between the Modbus network and the other ground points. The isolation is formally rated at 500V although we have hi-pot tested to 2kV without damage. 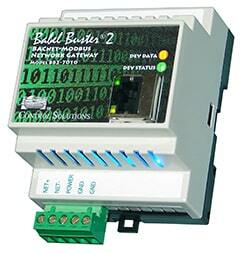 The standard model BB2-7010-01 provides Modbus and BACnet IP clients and servers. The BB2-7010-02 adds an SNMP client and server. 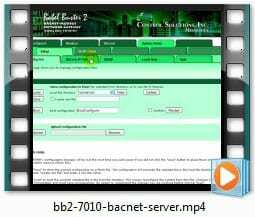 The combination of SNMP agent (server) and BACnet IP client makes BACnet IP devices accessible from SNMP. The SNMP client allows SNMP devices to be accessible from BACnet IP or Modbus. You configure the remote SNMP agent's IP address, the OID of the MIB variable you wish to poll, and set a polling interval. The object data is stored in the BB2-7010 server for subsequent retrieval by any supported remote client. The BB2-7010 includes its own internal web server that provides a web based user interface for configuring the BB2-7010. Configuration is done using simple templates, and each web page has an online help section at the bottom. Babel Buster BB2-7010 models for WiFi sensors are extensions of the BB2-7010 family that add support for third party WiFi products. These versions of the BB2-7010 receive UDP and/or TCP data packets from sensors via a generic off-the-shelf WiFi access point, parse the data packet, and place the sensor data in one or more BACnet objects. The sensor data objects may be accessed via BACnet IP, Modbus TCP, Modbus RTU, or SNMP. All of the standard features found in the BB2-7010-02 are available in the WiFi support versions of BB2-7010. In most cases, the spontaneous transmit rate of the sensor is set in the configuring of the sensor, and the gateway will operate in "listen mode". Where applicable, the poll rate is configured via templates in the BB2-7010, and the gateway will poll the sensor at that rate. 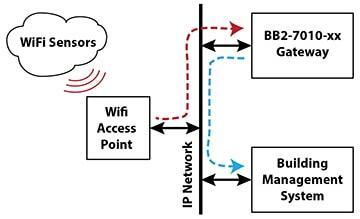 The WiFi sensor server is easily configured by simply entering information about the sensor's identity, and assigning BACnet objects that are to receive the sensor data. 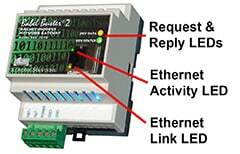 Data received from sensors is automatically scaled by the gateway so that standard engineering units are presented on the BACnet or Modbus networks. 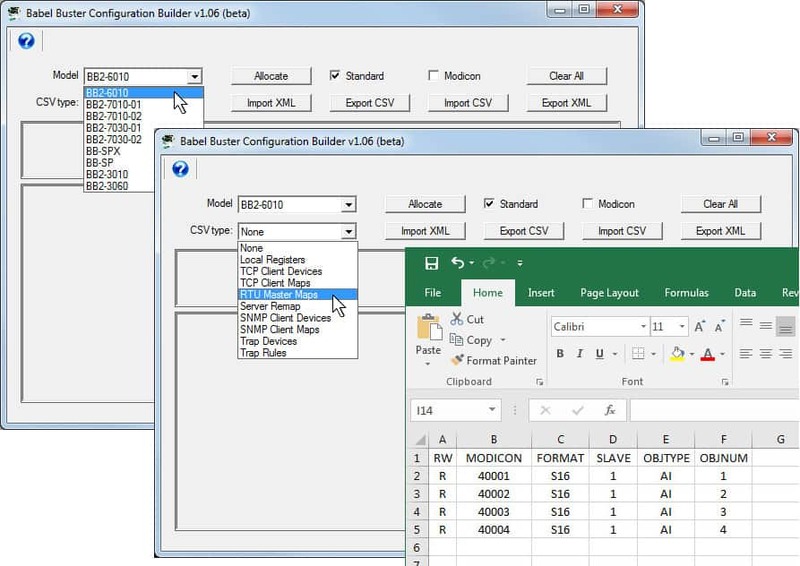 When using BACnet, COV subscriptions may also be used to send changes in data values. Babel Buster BB2-7010-06 is an extension of the BB2-7010 family that adds support for PointSix and AirTest Technologies WiFi sensors. The sensor types available include temperature with various sensor technologies, humidity, CO2, pressure, pulse count, generic voltage (0-10V) and current (0-20mA). The BB2-7010-06 also includes support for the alarm capabilities of the PointSix sensors. High and low alarm thresholds, alarm time, and hysteresis may all be entered via the gateway. Alarm thresholds may be a fixed configuration setting, or may be provided by additional BACnet Analog Value objects (also accessible as Modbus registers). Alarm states may be assigned to BACnet Binary Value objects with COV subscriptions providing notice of alarm state changes. The alarm states may also be configured to generate SNMP traps, or may be read as Modbus registers. Babel Buster BB2-7010-07 is an extension of the BB2-7010 family that adds support for Veris Industries WiFi sensors. The BB2-7010-07 accepts either UDP or TCP data from the Veris sensors. The sensor types available include temperature with various sensor technologies, humidity, CO2. Refer to the Veris Industries web site for the most recent sensor listing. Babel Buster BB2-7010-08 is an extension of the BB2-7010 family that adds support for Functional Devices WiFi RIB relays/sensors. The RIB universal inputs support 0-5V, 0-10V, 4-20mA, and thermistor. Additional user configured scaling is provided (optionally) by the gateway. The universal inputs can also be configured as state (on/off) inputs. The universal inputs, in addition to fixed discrete input, can be assigned to any of the gateway’s BACnet objects. The relay in the RIB can be controlled by a BACnet Binary Output object in the gateway. The gateway also provides binding between a discrete input on one RIB to the relay output on a different RIB if configured by the user. The BB2-7010-08 will query WiFi sensor data and command the relay output at whatever poll rate is configured by the user via the web pages available in the BB2-7010-08. The BB2-7010-08 can also be configured to send the sensor data to other Modbus slaves or BACnet IP servers, or retrieve relay output state from another device.